A simple cake we make every year during a holiday, tropical treat and very festive when decorated. 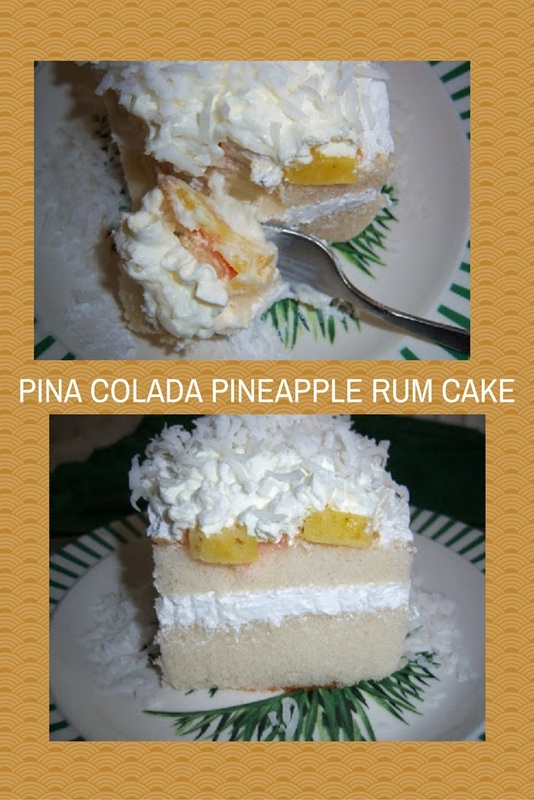 this Pina Colada Pineapple Rum Cake is a cake that keeps well for a few days, so you can even make this one ahead of time! Moist and delicious! They'll never know it's from a box! In a seperate bowl mix condensed milk ,creme of coconut together, add 2 tablespoons of rum to that mixture. Poke holes in the cake while hot, pour this over a hot cake, at this point you can add crushed or fresh to the cake. I use a 13x9 cake pan or 2 9x9 cake pans. When cool, frost with whipped creme and sprinkle with coconut..
Looks delicious and I love the rum in it - I bet coconut rum would be awesome! wow,claudia,i give to you all my salads for a piece af this delicate cake! You put the rum in the coconut cake, and eat them all up. Yum! This cake looks so awesome. Must resist making it! That cake is the perfect dessert for the long Labor Day wkend. Great job, Claudia! You know that this scrumptious cake is for me, right? Is still available any leftovers?? Oh, how could I resist this beauty! Both coconut AND pineapple...truly yummy, Claudia! You are killing me with all of these amazing desserts! Love coconut, love pineapple...love! An irresistible cake, so creamy and with all that rum. Wow! Please share this with us at Bake with Bizzy. You must have a sweet tooth like me Claudia. This sounds heavenly. I love making things from scratch but have to admit that box recipes can be great. This one sounds like a winner. Thanks for sharing. What I would do to dive into this gym cake right now! This looks divine. Love it. You always make the most delicious food. Ohhh, this looks so delicious!! I love the idea of the coconut creme! I love how you took a boxed cake mix and made it your own!